One of the best sources of resveratrol is wine. Resveratrol is an antioxidant that is mainly found in the skin of red grapes. It is also one of the main components of Ko-jo-kon, which is an oriental medicine that is used to treat diseases that attack the blood vessels, heart, and liver. How resveratrol came to the public’s attention was in the 1990s, scientists began to think that resveratrol was the reason that hardly any French people suffered from heart disease, despite the high-fat diet that they follow. Since this scientific discovery came about more studies have been done on resveratrol and it has been found to be a beneficial antioxidant that acts as an anti-cancer agent, and as a phytoestrogen, in addition to helping treat heart disease. The reason wine is a great source of resveratrol is that the best natural source of resveratrol is in Vitis vinifera, labrusca, and muscadine grapes, which are all types of grapes that are used to make wine. Resveratrol is found in the vines, roots, seeds, and stalks of the grape plants, but the highest concentration is found in the skin of the grape. The skin of each grape contains 50 to 100 micrograms per gram. Since wine is made from grape skins, it is only natural to assume that resveratrol is going to be found in high concentrations in wine. While wine is obviously a source of resveratrol, it is not the best source of resveratrol. The reason that wines are not the best source of resveratrol is because the amount of resveratrol that is found in a bottle wine is related to the time the grape skins are present during the fermentation process. The shorter amount of time that the grape skins are fermented with the wine the lower the resveratrol content, the longer the skins are left in the fermenting process the higher the concentration of resveratrol. With this in mind, red wine is a better source of resveratrol than white wine because the skins are kept in the fermenting process longer for red wine. Even with red wine, one fluid ounce of red wine only contains 160 micrograms of resveratrol, which is not that much when you think of how many grapes were used to make that fluid ounce of red wine. Another choice you have is taking red wine supplements, which contains Vitamin C and Red Wine Complex. The Red wine Complex is going to contain the resveratrol that is needed. 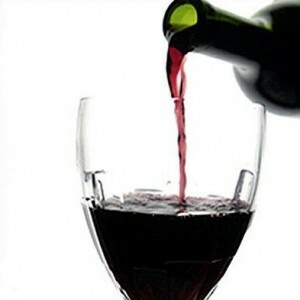 Therefore, even if you do not drink wine, you can take a red wine supplement to see the same health benefits.